Winter 2018: Here are 2 easy home remedies using black pepper than may help alleviate symptoms of cold and cough. When it comes to remedying cold and cough, we all tend to resort to trying home remedies passed down to us by our mothers and grandmothers. A number of Indian spices come handy when one is suffering from common cold during winters. These spices can be added to everyday foods and drinks and can be consumed to lessen symptoms like congestion and runny nose. Some of the most common warming winter spices and herbs, which are often used in home remedies for cold, include ginger, nutmeg, star anise, cinnamon, tulsi or holy basil and black pepper. 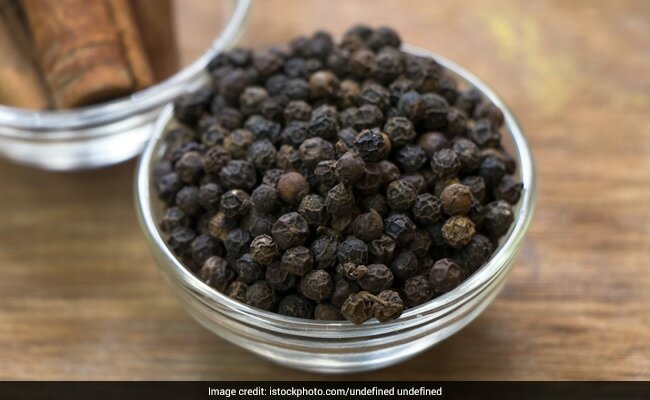 Among these, black pepper is one of the best Indian spices to include in your soups and hot beverages during winter, especially if one is suffering from chest congestion and common cold. It is easily available in the kitchen as it is used to add flavor to a number of dishes and is very easy to use to alleviate symptoms of cold. Black pepper originally belongs to the Southern part of India but not it has found use in a number of pan-Indian dishes as well. It is extensively used in food, especially during winters, due to its soothing effects on the throat. Black pepper is antibacterial and antibiotic in nature, due to the presence of immunity-boosting Vitamin C in it. It is commonly used to remedy cold by crushing black peppercorns and adding them to a teaspoon of honey. Honey is known to soothe a sore throat, suppress cough and can boost the cold-fighting action of black peppercorn. You may add a few drops of warm water to the crushed peppercorns and honey, in order to dilute it and make it more palatable. Consume this honey and black pepper tonic early in the morning to fight symptoms of common cold during winters. Also Read: 6 Herbs For Fast Metabolism, Rev It Up Naturally! Indians love their chai and the milky concoction is particularly popular during winters, as the caffeine indulgence energises the body, removing the sluggishness that sets in during cold weather and is also said to warm your body from inside. However, if one is suffering from cold, one may add freshly crushed black pepper or black pepper powder, along with sea salt instead of sugar to their cups of chai. On the other hand, some people avoid milk during cold as it is said to irritate the throat further. If you want to avoid the milk, you can simply boil freshly crushed black pepper with black tea and add sea salt or honey to it (according to what you prefer). Both black pepper and sea salt are said to soothe the cold and sore throat. Persistent cough and cold may be problematic and maybe symptomatic of a more serious ailment. Get yourself checked if your cold and cough persists for a long time.